In the window and door profiles industry, uPVC is a fairly new entrant. A lot many are usually confused with uPVC and when there is another variation cPVC our minds often wonder what the difference is. Today we will check out what is the difference between cPVC vs uPVC. Before, we begin decoding cPVC vs uPVC; let us understand what cPVC profiles and uPVC profiles are individually. What is a cPVC profile? cPVC is known as chlorinated polyvinyl chloride. It is better known as PVC’s cousin since the both have many similar properties. cPVC is produced through a chlorination process of PVC resin. So, what is a uPVC profile? uPVC stands for un-plasticized polyvinyl chloride. uPVC is used as an alternative to wood, aluminium in the building industry and can be used to install windows and doors in a home or commercial building. uPVC has a certain versatility and can be made to look like wood, metal. They are produced in captivating textures to match the needs of the consumers. Now, we understand what a cPVC and uPVC profile is individually, let us gauge the difference between cPVC vs uPVC in a comparative study. Temperature UPVC is recyclable and can be remade with a design at high temperatures. It is suitable for hot water applications. It can handle a temperature of 200F. Durability uPVC is highly durable and it can withstand torrential rains and high winds. cPVC is less durable as compared to UPVC. Uses While uPVC profiles majorly in the building industry. cPVC profiles are used for industrial liquid handling. Surface uPVC has a smooth surface inside which does not require cause any leak. cPVC profiles have a super soft surface which makes them ideal to carry water in distant places. Weather proof uPVC profiles does not shrink or change under harsh weather conditions. It is ideal for window and door frames. UPVC windows and doors consume less energy than wood and metal. cPVC profiles are energy efficient and can sustain in tough situations. Installation uPVC profiles are easier to fabricate and install windows and doors cPVC since has a softer surface, it is slightly difficult to use them for windows and doors. Hence they have different uses. With such a detailed analysis of uPVC and cPVC profiles, it is understandable that uPVC is the clear winner for windows and doors installation. 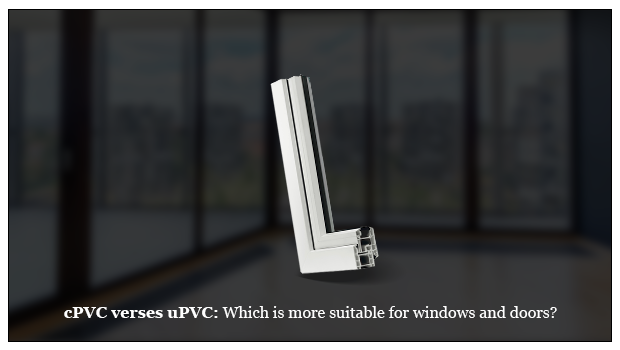 More additional information on uPVC profiles, explore: https://okotech.in/ .